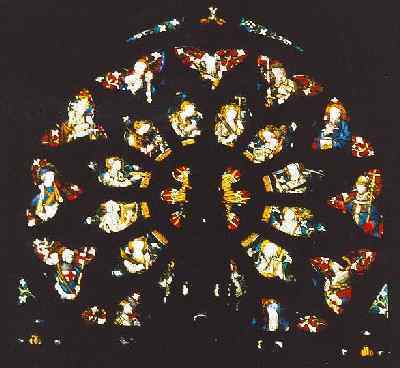 Father Gregory Swann made a plan and wrote an account of the Rose Window above the High Altar. The centre depicts the Virgin Mary. The inner circle, running clockwise and starting at 1.00 o’clock shows St. Margaret, St. Elheldreda, St. Sativola, St. Winefride, St. Scholastica, St. Agatha, St. Walburga, St. Ursula, St. Cecilia, St. Lucy, St. Catherine and St. Agnes. (St Sativola, Patron of Millers – Richard and Hugh Ainscough belonging to a Milling family). In the outer circle and following the same direction are seen St. Paul, St. Bede, St. Thomas of Canterbury, St. Thomas More, St. Benedict, St. Joachim, St. Edward, St. George, St. Alban, St. Gregory, St. Peter and St. Joseph. This window and the beautiful Mensal carving of the Coronation of Our Lady and the glory of All Saints, makes a splendid visual portrayal of the dedication of the church.